A dental hygienist is a highly trained and licensed oral health professional who provides you with educational, clinical, and therapeutic services to enhance your oral and overall health. A dental hygienist uses her skills and knowledge to prevent, detect, and treat gum disease and tooth decay in her patients. Hygienists receive intensive, specialized education and training that includes courses in chemistry, head and neck anatomy, physiology, , microbiology, pathology, nutrition, pharmacology, advanced dental sciences, and dental hygiene. Prior to graduation, hygienists must complete hundreds of hours of supervised instruction in clinical practice. Why is it important for you to see the hygienist? The hygienist will thoroughly clean all surfaces of your teeth, removing plaque, tartar, and stains from above and below your gum line (the point where your teeth meet your gums). She will evaluate the health of your gums, and she may be involved with the specialized treatment of advanced gum disease, which includes procedures such as scaling and root planing. Your hygienist will also teach you how to effectively care for your teeth at home to help you prevent decay and periodontal disease. The hygienist may take and develop dental x-rays so the Houston dentist can view them and quickly diagnose any problems. Your hygienist may also explain the relationship between your diet and dental health, offering suggestions about which foods to select and which to avoid. She may apply fluoride gels, show you how to select the proper toothbrush, and demonstrate the most effective techniques for brushing and flossing to help you maintain excellent oral hygiene. Who’s Taking Care of Your Oral Health? When you go for your oral health appointment, make sure you are receiving care from a properly educated and licensed oral health prevention specialist—a registered dental hygienist. Ask the person delivering care if he or she has graduated from an education program accredited by the American Dental Association Commission on Dental Accreditation. Look to see if the dental hygienist’s “RDH” license is in plain view. Get to know your dental hygienist by name. Ask your dental hygienist for treatment and at-home-care plans. Ask your dental hygienist to recommend oral health products that are specially formulated for your oral health care needs. Prevention is the key: discuss any questions or concerns you have about oral health as part of total health with your dental hygienist. So What Should You Expect from Your Dental Hygienist? 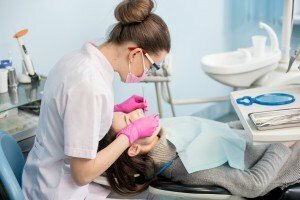 After assessing a patient’s individual oral health condition and incorporating the most current scientific research, including consideration of the impact of oral health on diseases such as heart disease and diabetes, dental hygienists plan a specific treatment plan designed to make sure each patient has the best oral health possible. Targeted and specific dental hygiene treatment for children, adolescents, adults, older adults, and patients who are medically compromised. Because targeted and specific systemic diseases like heart disease and diabetes, as well as other conditions, have signs and symptoms that appear in the mouth first, dental hygienists monitor for evidence of disease, and where they find suspicious conditions, inform the patient and recommend a visit to a physician. While assessing a patient’s overall health, they also look for problems such as caries (cavities) and periodontal (gum) disease. Dental hygienists perform thorough head-and-neck examinations to look for oral cancer and other problems. To prevent and treat disease, they remove plaque (a stubborn film that contains bacteria),and calculus, both above and below the gum line. To prevent caries, dental hygienists provide nutrition counseling, apply fluorides or pit-and-fissure sealants, and in some states, polish and contour fillings. Because dental hygienists specialize in preventive oral health care, they educate their patients, the community, and schools on oral health and its effect on overall health, as well provide dietary education and counseling. They expose, develop, and interpret oral X-rays. In many states, registered dental hygienists administer local anesthesia and/or nitrous oxide. Dental hygienists also evaluate how their recommendations are working and, when necessary, revise treatment as it progresses to help patients achieve their oral health goals. The dental hygienist is an excellent resource that can help you and your family keep your healthy smiles for a lifetime!